Can minerals be extracted from the seafloor without environmental impacts? A year ago, the Canadian mining company Nautilus Minerals was poised to launch a new industry: mining the deep ocean floor. All Nautilus had to do was finish building special equipment and arranging permits to work at a site it had leased off the shores of Papua New Guinea (PNG). Then it would commence grinding copper-rich rock on the seafloor into a slurry, vacuuming it up, and pumping it to a ship on the surface (see interactive). The company would also recover precious metals such as gold and silver, as well as zinc and other commercially traded metals. Nautilus’ plans alarmed many scientists. 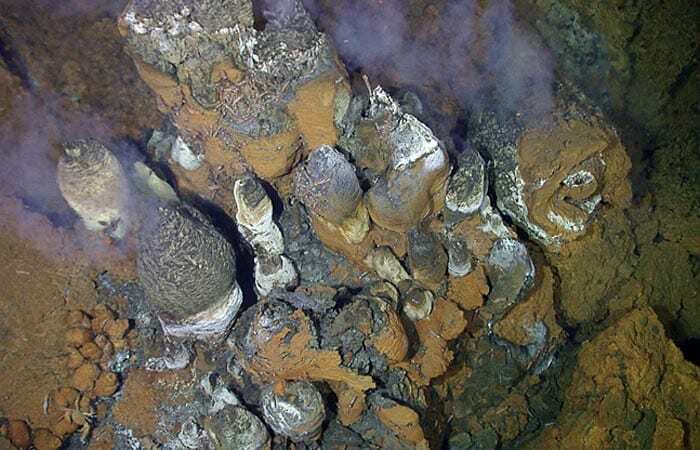 The mining was targeted at hydrothermal vents, where chemical-rich fluids spewing from the seafloor spur the accumulation of not only metals, but also lush communities of exotic life. Ever since deep-sea vents were first discovered in 1977, they have yielded a treasure trove of scientific clues about how our planet’s surface formed, how the oceans’ chemistry works, even how life may have started on Earth. What if a gold rush into these unique ecosystems were to produce a subsea version of the environmental damage that mining has caused on land? But then copper prices plummeted with the global economic slowdown, and Nautilus put many of its plans on hold. “I think a lot of us on the science side were actually relieved,” Tivey said. But will the pause in the action make a difference? 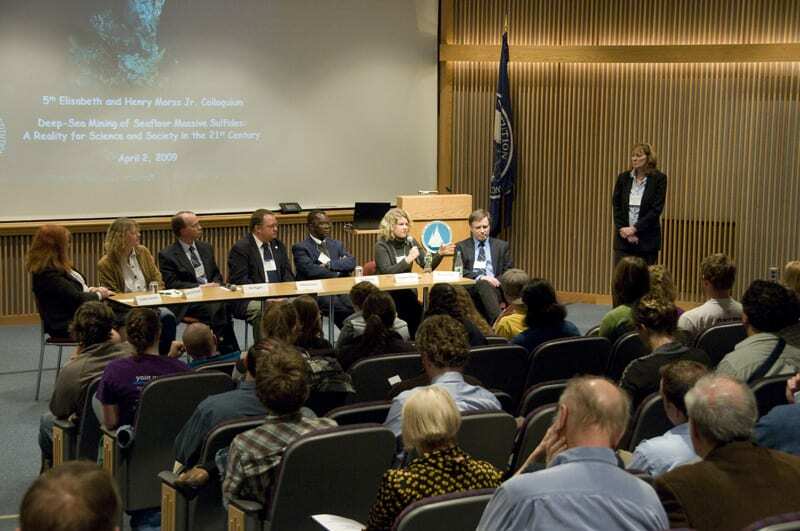 In April 2009, a wide range of stakeholders from 20 countries pondered that and other issues at a conference on seabed mining convened by scientists at WHOI. Environmentalists, representatives from Nautilus and other major mining companies, international policymakers, and 98 scientists in a diverse range of fields gathered to share knowledge, seek common ground, and discuss seabed mining guidelines. With scientists just beginning to understand the geological, chemical, and biological forces that conspire to create vents, mineral deposits, and vent life communities, the conference explored how the scientific community can best bring its knowledge to bear. How can scientists help locate and evaluate mineral-rich sites? 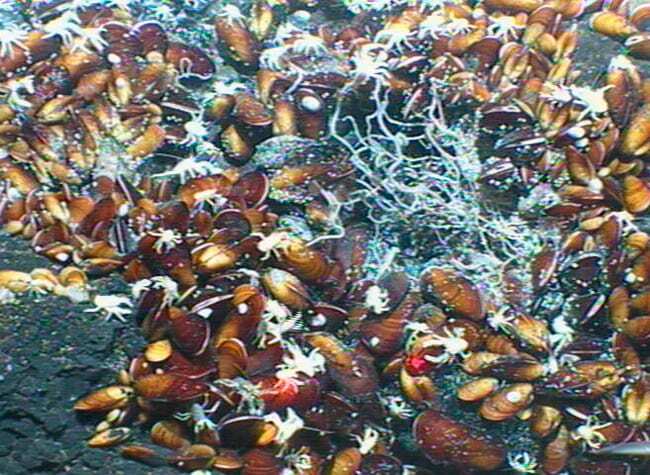 How can they help protect the unique oases of deep-sea life at vents? The metals lie in what are called seafloor massive sulfide deposits. They form as the result of a series of chemical reactions that start when seawater filters down through permeable ocean crust into rocks heated by magma below. The heat catalyzes reactions that leach metals from the rocks into the fluids. The hot fluids—which can reach up to 750°F (400°C) under the pressure in the deep—rise buoyantly back to the seafloor. As they emerge from the crust, they encounter cold water, which causes metal sulfides to precipitate out of the fluids and form solid deposits near and on the seafloor. The ocean’s known sulfide deposits may be only a fraction of what’s actually there. “There’s a lot of real estate out there where no data have been collected,” said WHOI geochemist Chris German. Scientists think most are either in or near the 40,000-mile (60,000-kilometer) long mid-ocean ridge system. There, the Earth’s tectonic plates are forming and actively spreading apart, creating volcanically active mountains that blister across the oceans’ floors in patterns roughly resembling the stitched seams on a baseball. 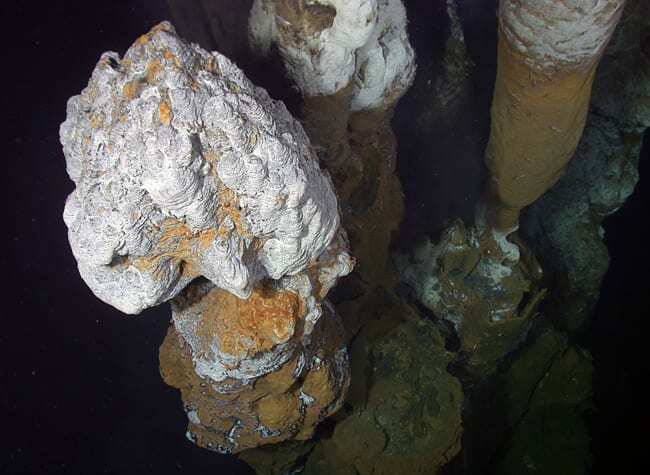 Minerals precipitating from fluids coming out of hydrothermal vents can create chimney-like structures jutting out of the seafloor. The fluids billow out of the growing chimneys in smoky-looking, dark or white plumes (see interactive). These were first discovered on fast-spreading ridges where volcanic activity occurs relatively frequently. But it turns out that venting can take many forms and also occurs on slow- and even ultra-slow spreading ridges. Scientists now think that slower spreading ridges produce larger massive sulfide deposits. That’s because in these places, huge ramp-like faults penetrate deep into the crust and act as conduits. They bring a long-lasting supply of heated fluid from deep inside the Earth and deliver the minerals over tens of thousands of years to the same spot near the seafloor. Many massive sulfide deposits mined on land may have formed in the deep sea and then were raised or thrust above the water during the formation of islands and continents. The island of Cyprus, for example, holds 30 massive sulfide deposits, which were a main source of copper for ancient Rome. So far, about 200 active vent fields have been found. Most would probably not be of much interest to the mining industry. “The vast majority of deposits are really small,” said German. Some, however, are fairly large. One at a site called “TAG” on the slow-spreading mid-Atlantic ridge is the size of a baseball stadium. Hydrothermal vents also can occur in areas called back arc basins. They often form behind islands in subduction zones, where two tectonic plates are colliding, forcing one plate to slide deep into the Earth and form a deep-sea trench. For the mining industry, the western Pacific Ocean’s many back arc basins are particularly attractive. These potential seafloor mining sites are near land and often fall within the 200-mile exclusive economic zones of island nations, putting them under local, rather than international, jurisdiction (see “Who regulates seafloor mining?,” below). Meg Tivey, a geochemist at WHOI, said scientists are examining fluids coming out of the seafloor—the end-products of subsea chemical reactions—as clues to understand where and why different types of mineral deposits form. But many more deposits may have formed at vent sites that are no longer active. These sites, lacking billowing plumes, are much harder to find and haven’t been studied much. Just as each vent site is different, so are the ecosystems they foster. What each has in common are conditions that would be incredibly hostile to most other life—utter darkness, intense ocean pressure, hot acidic fluids. Yet most host rich communities of life, including microbes that harness energy from chemicals, instead of from sunlight as plants do. Scientists have observed that after undersea volcanic eruptions kill off animals around a vent, life can be quick to recolonize the habitats. “One argument that can be made—but we need to be careful about it—is that hydrothermal systems naturally are violent environments anyway, and therefore we can do what we like because the biological communities will always recover,” said German. Biologists who study the life around hydrothermal vents are still finding remarkable numbers of new species, and many are exquisitely adapted to different terrains and mixes of fluids. “There are many rare species that are difficult to count with statistical accuracy,” said Duke University biologist Cindy Van Dover. If vent sites are mined, “we don’t yet understand what will be lost,” she said. Any strategies to mitigate damage at various vent sites or to restore them, she added, must take into account that animal life differs at each site. Larvae of vent animals, moved by ocean currents, play an important role in establishing new colonies of life, and it seems the larvae of some vent species can travel very long distances. But “we’re just starting to get a handle on dispersal distances of vent larvae, so we can’t yet design ways to ensure protection of species,” said WHOI biologist Lauren Mullineaux. If larvae from snails arrive first at a site formerly inhabited by mussels, for example, they might create a thriving—but alternative—community, she said. Maybe disturbed vent sites are rapidly recolonized by “weed species adapted to handle great rates of disturbance,” suggested ecologist Kim Juniper of the University of Victoria. The result could be the subsea equivalent of replacing an old-growth forest with a field of dandelions. On the other hand, animals similar to those that originally inhabited the vent site could eventually return. Too little research has been conducted to know for sure. The argument for protecting species is the same as that on land—diversity is at the heart of functioning ecosystems; it helps life adapt to changing conditions; and it offers the potential for as-yet unknown insights into biochemistry and potential commercial biotech products. 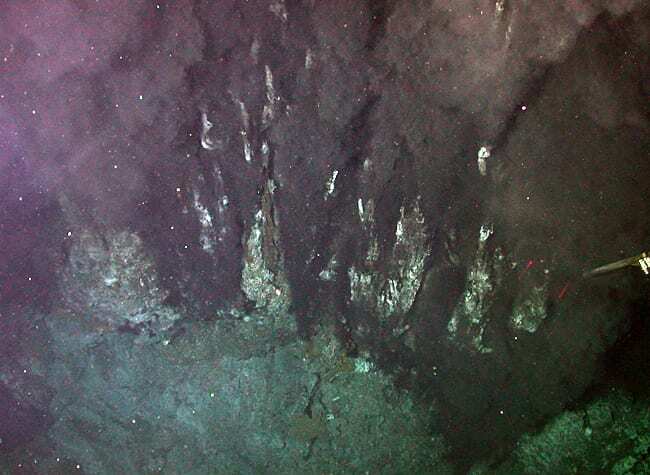 The concern over the fate of life at hydrothermal vents led many scientists at the April conference to a frequent refrain: Perhaps only inactive sites, where volcanism has “turned off,” should be mined. Just because a site is inactive doesn’t mean it is lifeless. Indeed, inactive systems host animals, too, but they are different from those at active sites and perhaps still vulnerable to damage. But to date few inactive sites have been studied. With no plumes of hot fluids emanating from inactive sites, they are the most difficult to find and the least studied. “How do we find the inactive ones? That’s the big question,” said Maurice Tivey. He and other scientists are investigating ways to use magnetometers on underwater vehicles to detect the magnetic effects of minerals; gravity-measuring devices to detect dense sulfide mineralization; and other devices to locate massive sulfide deposits—especially at hard-to-find sites that are inactive, or buried by lava or sediments, or in places where hot fluids ooze slowly up through a latticework of the crust, cooling enough on the way to drop their metals well below the seabed. “What we’re seeing coming up from black smoker vents appears to be only a fraction of the metals that are below or on the seafloor,” said geologist Mark Hannington of the University of Ottawa. In the future, experimental methods like those proposed by Maurice Tivey could also help mining companies and others efficiently estimate deposits without drilling, which is routinely done on land but has been prohibitively expensive at sea, he said. In 2006, Maurice Tivey led a 32-day research cruise, funded by the National Science Foundation, to explore the geology and chemistry of several active hydrothermal vent sites in the Manus Basin in the Bismarck Sea, which encompasses Nautilus’s Solwara 1 site. Interested in learning as much as possible about the region, Nautilus funded an additional 10 days of research at sea and the costs of using WHOI’s deep-sea robot, the Autonomous Benthic Explorer, for mapping. Scientists may prefer that mining be done at inactive sites, but Nautilus Minerals and other mining companies are investigating deposits that have already been found (largely because they are active). Nautilus Minerals’ first target site, called Solwara 1, is a 0.43-square-mile (0.112-square-kilometer) area that is hydrothermally active in some parts and quiescent in others. He cited Nautilus’ plans, adapted in consultation with marine scientists, to not mine areas with similar organisms as the Solwara 1 site and to establish temporary refuge areas within the proposed mining area where animals can progressively return. The company has conducted small-scale experiments installing appropriate artificial substrates to encourage animals to land and recolonize sites, as well as relocating animals out of the path of mining. Some argue that seabed mining offers an alternative that could be less environmentally destructive than land-based mining. The Solwara 1 deposit boasts copper deposits that are about 10 times more concentrated than a typical land-based copper mine, so less material needs to be extracted to achieve a similar production rate, Smith said. In addition, the Solwara deposits are at the surface, so large amounts of material don’t need to be removed to get to the ore, she said. Unlike land-based mining, seabed mining occurs where people do not live and requires little production infrastructure, all of which can be moved after mining is complete. And it offers “increased worker safety with the operations being conducted remotely and no one at the cutting face,” Smith said. Nevertheless, after Nautilus representatives described its plans to people on Bagabag Island in Papua New Guinea two years ago, local villagers told marine biologist Rick Steiner of the University of Alaska Anchorage that they were not happy. Through an interpreter, the villagers asked Steiner if he would come help them attack the Nautilus ship. “I said, ‘I was thinking I’ll help you review the Nautilus EIS [environmental impact statement],’ ” he recalled. Bagabag Island is 300 miles (500 kilometers) away from the Solawara 1 site, but Nautilus has exploration leases and lease applications for vast areas elsewhere in the Bismarck Sea, including near Bagabag Island and the main island of Papua New Guinea. In 2008, the newly formed Bismarck-Solomon Seas Indigenous Peoples Council met in the village of Karkum for a seabed mining forum and issued a statement that concluded, “. . . we do not consent to the sea bed mining activities in our waters and seas,” and asked for all mining activities to cease until the council’s concerns are satisfactorily addressed. Among his concerns is that boats, barges, and heavy equipment could accidentally pollute the local waters and shorelines. That includes several shuttle barges a day, each holding thousands of tons of wet sulfide slurry, fuel, and other hazardous materials. Sulfides can rapidly oxidize once they’re out of the low-oxygen deep sea. If they’re wet, they can turn into sulfuric acid. Meanwhile, a working group from InterRidge, an international consortium of scientists working on mid-ocean ridge studies, used what it learned at the WHOI colloquium to suggest areas for future research. It presented its questions and recommendations to the International Seabed Authority, the independent treaty agency charged with managing seabed mining in international waters. Many of the InterRidge questions are fundamental, reflecting just how young this scientific field is—from how long seafloor massive sulfides take to develop to how vent biological communities change over time. The recommendations include developing criteria for determining just how active or inactive a vent site is, working on ways to locate inactive deposits, and encouraging studies of organisms living at inactive sites. Just how much breathing space is not clear. Copper prices are recovering, and in September, the PNG minister for environment approved Nautilus’ environmental impact statement for Solwara 1. PNG still must approve environmental permit applications before it grants the company a mining lease to commence mining operations. Nautilus also has exploration licenses and applications (see map) to search for potential minable sites in more than 525,000 square kilometers of seafloor off the shores of Papua New Guinea, the Solomon Islands, Tonga, Fiji, and New Zealand. The “Precious Metals from Deep-Sea Vents” workshop and colloquium was funded by the Elisabeth W. and Henry A. Morss, Jr., Colloquia Endowed Fund at WHOI, the ChEss (Chemosynthetic Ecosystem) project of the Census of Marine Life, InterRidge, Ridge 2000, and the WHOI Deep Ocean Exploration Institute. The rules that govern mining on most of the world’s seabed are no ordinary rules. They got their start back in the 1970s and 1980s, when it looked as if there were untold riches in manganese nodules scattered across the ocean floor. To regulate seafloor mining, in 1994 the United Nations Convention on the Law of the Sea spawned the International Seabed Authority, or ISA, an independent treaty organization. It has jurisdiction over the seabed outside the exclusive economic zones that surround nations’ shorelines—an area it efficiently calls The Area. The term refers only to the seafloor, not to the waters above it (they’re called the “high seas” in legal parlance). The rules dictate that the ISA make licensing decisions and, remarkably, that a portion of all profits from mining in The Area be used to benefit the world’s developing countries. The ISA has 159 member nations. The United States is not one of them, because it has not ratified the Law of the Sea treaty, though it has “observer” status. Political conservatives have successfully blocked the move so far, even though President George W. Bush in 2007 urged the Senate to approve the agreement. Current U.S. Secretary of State Hillary Clinton has made clear that U.S. ratification of the treaty is a priority for the Obama administration. The new ISA regulations are expected to open up The Area to commercial prospecting for seafloor minerals. The Dive & Discover Web site includes information about hydrothermal vents, videos, podcasts, and interactive graphics.